The Genesis Open is the latest incarnation of the venerable Los Angeles Open. The tournament also has been known as The Glenn Campbell-Los Angeles Open, The Nissan Open and the Northern Trust Open. The event has been played at the fabled Riviera Country Club since 1973, with the exception of 1983, when the club hosted the PGA Championship and 1998, when it hosted the US Senior Open. In addition to Hogan, other prominent Genesis Open winners include Phil Mickelson, Fred Couples, Tom Watson, Arnold Palmer, Byron Nelson and Sam Snead. Jack Nicklaus never won a Los Angeles Open. The inaugural Los Angeles Open was played in 1926 at the Los Angeles Country Club. The next year, it moved to El Caballero Country Club in Tarzana. It moved again in 1928 to the Wilshire Country Club in Los Angeles. The Los Angeles Open made its first appearance at the Riviera Country Club in 1929 and 1930. In the 1930s the event was held at the Wilshire Country Club, the Hillcrest Country Club, The Los Angeles Country Club an Griffith Park. Following a break for World War II, the Los Angeles Open was played at the Wilshire Country Club in 1944, and then for the next nine years at Riviera. In the 1950s, it was played at Fox Hills Country Club, Inglewood Country Club and Inglewood. Rancho Park hosted the event from 1956 to 1972. Riviera Country Club, the current host of the Genesis Open – Los Angeles Open is one of the country’s fabled courses. 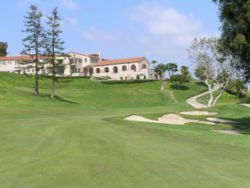 The course opened in 1926 as the Los Angeles Athletic Golf Course with George Thomas listed as its principal designer. Credit, however, also is given to Alister Mackenzie and Billie Bell. After several redesigns, Ben Crenshaw and Bill Coore made an attempt in 1992 to return Riviera’s bunkers to the original Thomas-MacKenzie design. Thomas’ work at Riviera is oft cited for its risk-reward design. The first, for example, is a short par 5 that has a tee elevated some 75 feet above the fairway. It’s possible to make an Eagle on this hole, but thanks to out of bounds left and a ditch crossing the fairway, a wayward drive can drive to score to a double bogey. The par 4 eighth has two fairways separated by a ditch. Ten, a par 4 , is drivable, but greenside bunkers make it a risky proposition. The eleventh and twelfth are defended by ditches, bunkers and trees. I also think it has one of the great finishing holes—a par 4 with a mostly blind tee shot and a green situated in a natural amphitheater. The course also has a bit of humor. The par 3 sixth has a bunker in the middle of the green. I wonder what Hogan thought of that. For my part, Riviera is on my list of courses I’d most like to play.